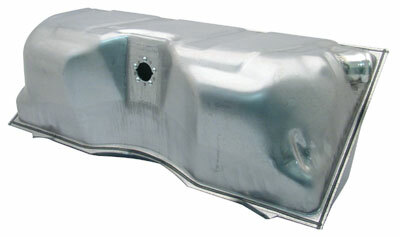 OEM gas tanks available for your classic car or truck. Tanks are the factory dimensions and have the factory capacity. 1955-57 Chevy passenger car tanks are available with factory style bent corners (-S) and also rounded corners (-R). #6366FMT-K and #6772FMT-K are designed to convert from cab to under the bed. In some applications it may be necessary to notch rear bed cross sill 1/8"-1/4" to provide clearance for this tank. Note: Gas tanks ship O/S; additional freight charges apply.